Deciding that discretion is the better part of valour, and also having to select between two opposing FOMO scenarios, yesterday I evacuated Waiheke, turning my back on the promise of roaring winds down the valley and crashing surf on the beach, and skittered back to the city. While it would have been exciting to have experienced Cyclone Pam over there, even in her cooler-climate downgrade incarnation, it felt more important not to risk being stranded on the island by possible ferry disruptions. As it happened, and to the deep disappointment of the drama-junkies on Twitter, the severe gales and high seas didn't eventuate here, although Great Barrier Island, for eponymous reasons, copped some rough weather, and East Cape and the Bay of Plenty are still waiting to see what Pam brings them. For myself, I'm very happy that there was no damage and destruction, and don't mind one bit that all that battening was unnecessary. I can even live with there being no freshly-revealed seaglass on the beach. Vanuatu, of course, had no such luck at all. It must have been truly terrifying for those poor people. The thing I decided it was more important not to risk missing out on is my trip tomorrow to - what are the odds? - Perth. Why yes, I was there just last week. Previous to that, I hadn't been there since 2011, and before that 2008. And before that, 1977. I'm only mildly surprised, myself. That's how things often seem to work out in this job - and I'm certainly not complaining. 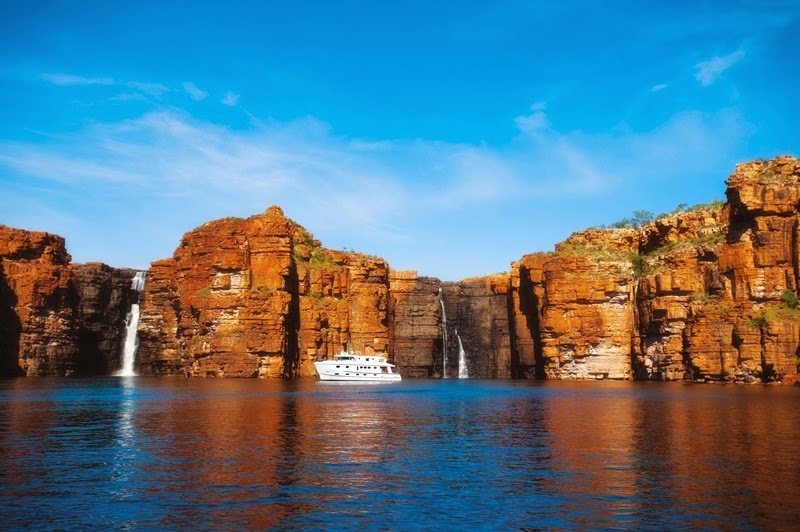 In fact, it's not Perth that's the focus of this trip: I'll be passing through to head up to Broome and thence by sea-plane to join the Kimberley Quest on a short taster of the cruises it does around the Kimberleys right at the north-west tip of Western Australia. It's a spectacularly beautiful area of warm turquoise sea, white sand and orange cliffs, somewhere I've never been and have been fancying something rotten for ages, so what a fabulous treat it is to be going there. Watch this space.